Giancarlo was born in Cardiff, South Wales, of Italian parentage, and now lives in London. He spends much of his non-writing time listening to a variety of music, from Jimmy Smith to Giuseppe Verdi, with whom he is particularly obsessed. He speaks enough Italian to order ice cream, cake, or both. 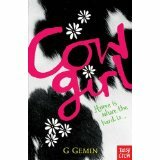 Cow Girl was shortlisted for the Branford Boase Award and Waterstones Children’s Book Prize. Find Giancarlo on Twitter @grgemin. Growing up on the embattled Mawr Estate in South Wales, all Gemma sees are burglaries, muggings, sadness and boredom. With a dad in prison and a mum who has given up hope, she, like everyone around her, is holding on to memories of the times when happiness wasn’t so hard to find. When her search for the scene of a perfect childhood day takes her up into the surrounding hills, Gemma is forced into a meeting with the legendary Cowgirl. Everyone at school knows she’s a weirdo: six foot tall and angry, the only conversations she has are with the twelve cows on her dad’s farm. But with her abrupt arrival in Gemma’s life, everything starts to look different. And with her only friends in mortal danger of the abattoir, it turns out she and Gemma have a mission on their hands. A gently funny story of a community coming together, this is a tale of happy endings in unexpected places.